Bicycling in the Netherlands is a way of life. The Dutch have an affinity for their two-wheeler like no other European country. 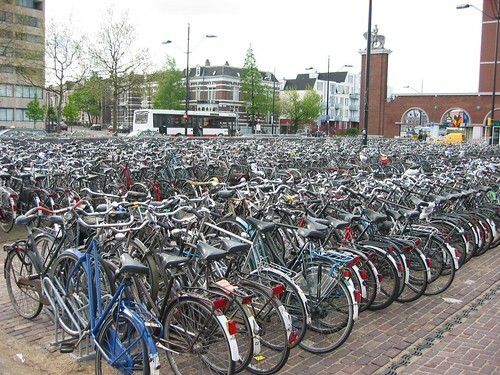 The Netherlands is considered a cyclist’s paradise. The country offers easy cycling terrain with many cycling paths separate from the main traffic as well as many designated biking facilities. The Dutch have developed a special biking infrastructure, which is widely used. A potential problem to this bicycle haven is that it can get a bit crowded on the cycling lanes, where so many people often ride with different attitudes, skill levels, and at varying speeds. The large use of bicycles does however lead to the wide availability of diverse facilities, like many dedicated bike paths, repair shops, rental points and guarded parking. Cycling paths or lanes are very much in use to separate bicycle traffic from motorized traffic. This separate network features its own traffic lights and direction pointers (red lettering on white backgrounds). The main motivation and function of this approach is the protection of the cyclist from motorized traffic. It can result, however, in the frustrating situation of having to constantly yield right of way and experiencing increased waiting time at traffic lights.